The song was written in 1919 by Clarence Williams and Armand Piron and is usually associated with a shimmy dance move, but was there actually a 'sister Kate'? Let’s unwrap ‘The Shimmy’ first. It roared outrageously into the 1920s along with the Charleston, the Black Bottom and the Varsity Drag when a new dance seemed to come out every week. The dance was often considered to be obscene and was frequently banned from dance halls during the 1920s, more moderately it was described as ‘naughty’ and in the video you will see that one newspaper described it as ‘The ‘Shimmy Dance’ – Outlawed as a Dance but Highly Valuable as a Personal Boudoir Exercise to Beautify Shoulders and Neck’! 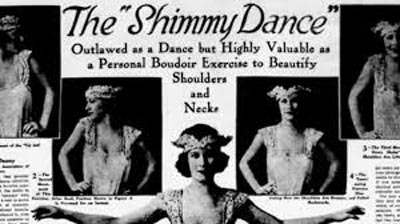 The claims to the origins of the Shimmy, which was also named the ‘Shimmy She’ or descriptively the ‘Shimmy Sha Wobble’, are varied. There is a claim that the dance goes back to Haitian Voodoo movements. We read in Wikipedia: ‘Gilda Gray (the actress and dancer who popularised the Shimmy) attributed the origin of the 'Shimmy' to the American Indians in an interview published July 8 1919 in Variety saying "You may not believe it but the original shimmy dance has never been properly introduced in New York. I know, for I have studied the dancing characteristics of the Indians for a long time and they are really responsible for the shimmy which they labelled the 'Shima Shiwa'. There have been continual efforts on the part of this dancer and that one, with each declaring that his or her version is the 'original.' There is no doubt but that the shimmy dance as it was constructed by the American Indian... would have a greater popularity if done right." The video seems to suggest that it was mainly women who were the focus of the dances and there has to be truth in that. In the book Seeing The American Woman 1880-1920 (Katherine H. Adams, Michael L. Keene, Jennifer C. Koella), it is noted that: ‘...Mae West first saw the dance as she wrote in her autobiography, in two African American jazz clubs in Chicago: “They got up from the tables, got out on the dance floor, and stood in one spot, with hardly any movement of the feet, and just shook their shoulders, torsos, breasts and pelvises. We thought it was funny and were terribly amused by it. But there was a naked, sexual agony about it too”. ... Critics’ reaction to this new dance, and especially to Mae West doing it, resembled the strongly negative but evocative response to hooch coochers and to Salomés. Sime Silverman in Variety reviewed her shimmy as an unfortunate return to the bawdiness of cooching, but admitted that she ‘bowled them over’ and ‘stopped the show with it’. 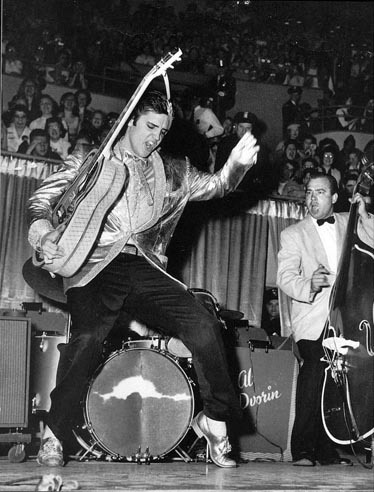 It would be some years before Elvis Presley caused the same male sensation and by the time Michael Jackson did the 'crotch grab', people hardly batted an eyelid. You can see how the Shimmy can be linked to the Belly Dance and that has a long history where, in the Ottoman Empire belly dance was performed by both boys and women in the Sultan's palace. I mean, when I shimmy like my sister Kate. 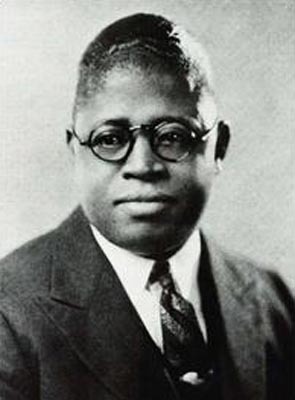 Before ‘Sister Kate’ was published in 1919 by Clarence Williams and Armand Piron, Spencer Williams, had already written the tune Shim-Me-Sha-Wobble in 1917. There are a number of versions available but click here for it played in New York in 1928 by Miff Mole and his Little Molers - Red Nichols, Leo McConville (trumpet); Dudley Fosdick (mellophone); Miff Mole (trombone); Frank Teschemacher (clarinet); Joe Sullivan (piano); Eddie Condon (banjo); Gene Krupa (drums). Although Clarence Williams published the song, it appears confusing as to whether he actually wrote it. As we have seen, it is 'variously believed to be based on a bawdy tune by Louis Armstrong (about Kate Townsend, a murdered brothel madam) or transcribed from a version performed by Anna Jones and Fats Waller. As far as we know, Clarence did not have a sister called 'Kate'. He was born in Louisiana and ran away from home when he was twelve to join Billy Kersand's Traveling Minstrel Show. When he moved to New Orleans he worked shining shoes and doing odd jobs, but soon became known as a singer and master of ceremonies. By the early 1910s, he was a well-regarded local entertainer also playing piano, and was composing new tunes by 1913'. He did have a neice, Katherine Henderson, but it is perhaps more likely that the lyrics just 'scanned'. Another of his compositions was 'Shout, Sister, Shout'. So was there actually a ‘Sister Kate’ who could shimmy? 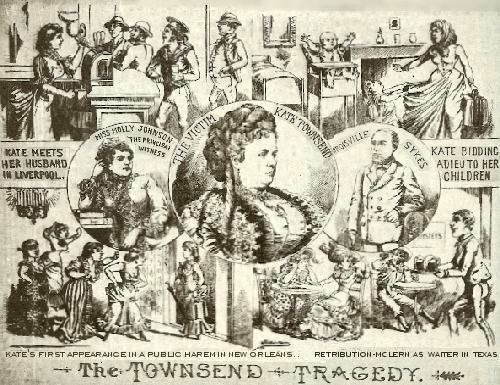 If the song was based on a bawdy tune by Louis Armstrong, it was apparently about Kate Townsend - the murdered brothel Madam. There is a comprehensive account of Kate Townsend on the Storyville New Orleans website (click here), but in brief, she was thought to have been born Katherine Cunningham in Liverpool in 1839. At fifteen she was a barmaid at a dance-house on Paradise Street and became pregnant by a sailor, Peter Kearnaghan. He left, she gave birth to twins and abandoning them, sailed for New York, changed her name to Townsend and travelled south arriving in New Orleans in 1857. Initially, she worked in brothels but by the age of 24 she had made some influential friends and set up her own premises at 40 Basin Street. A certain Treville Sykes became her 'fancy man' but later she became attracted to another man named McLern. Kate, Sykes, McLern and his partner, Molly, got into fights over the relationships and on November 3rd, 1883, a 'commotion was heard in Kate's room. The following morning, the Picayune paper carried the news: 'Carved to death! Terrible fate of Kate Townsend at the hands of Treville Sykes with the instrumentality of a bowie knife. Her breast and shoulders literally covered with stabs'. Whether or not that was the ‘Sister Kate’ and whether she could shimmy, we shall probably never know. So - how to end this article - Ottilie Patterson? Bunk Johnson? Muggsy Spanier? 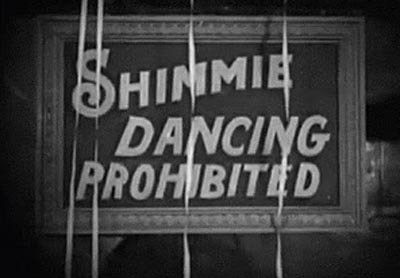 I have chosen this video with music by the Original Memphis Five from 1922 because someone has added posters and pictures showing how The Shimmy became an international sensation. The Original Memphis Five was an early jazz quintet founded in 1917 by trumpeter Phil Napoleon and pianist Frank Signorelli. Jimmy Lytell, a member from 1922 to 1925, and Miff Mole were musicians in the group. Jimmy Durante played piano (with Ladd's Black Aces) while both Tommy and Jimmy Dorsey were also members of the Original Memphis Five.